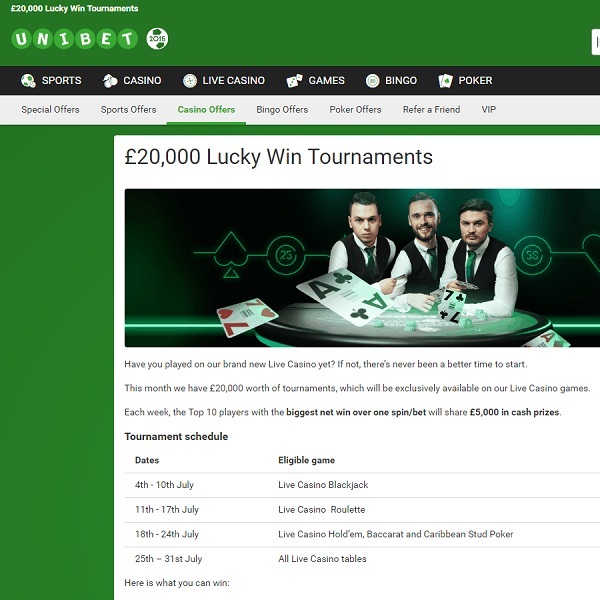 Unibet Casino has a brand new Live Casino and to celebrate they are giving you the chance to win a share of £20,000. The money can be won through a series of special tournaments with one taking place each week this month. Each week the top ten players with the biggest new win over one spin or bet will share in £5,000 cash. This week the eligible game is Live Casino Blackjack, next week its Live Casino Roulette, the third week its Live Casino Hold’em, Baccarat and Caribbean Stud and in the final week all the Live Dealer games are eligible. The top prize each week is £2,500, second prize is £1,000, third prize is £500, fourth and fifth prizes are £250 and sixth to tenth prize is £100. This is a great chance to explore the joys of live dealer gaming and possibly win a pile of cash at the same time so head over and start playing today.